Good Morning!! Happy Friday! Oh my goodness, I didn't think the day would get here. My mom and her husband will be here to visit for a week when I get home from work today. I'm excited to see her, I miss her a lot. I have two projects to share with you featuring Fun n Flair. It's my day to post to the Fun n Flair blog but it's also challenge day. So up first is a card I made featuring Miss Shayla at Christmas Time. It's a fun, non-traditional, fresh take on a Christmas card. I did follow the sketch from Papertake Weekly. This is Penguin Christmas and was perfect for this wintry fun page. These are my kids and one of the neighbor boys after a snowball fight after a HUGE snowstorm. I don't miss that about West Virginia. I believe that is the prettiest penguin I've ever seen. I hope you join us over at Fun n Flair for the challenge and some great inspiration. Hi again! 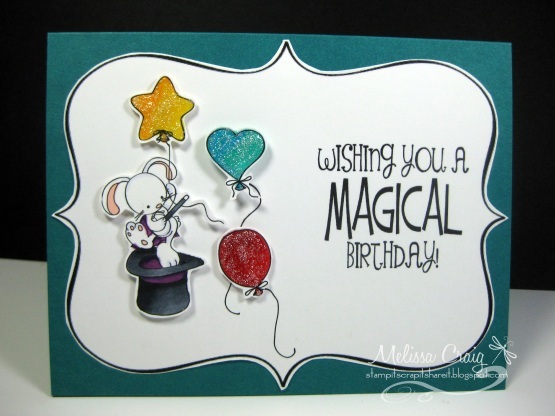 Thanks for coming back for the blog hop which kinda wraps up all the fun and festivities that have been going on all month to celebrate Sweet n Sassy Stamps' 5th birthday. ~There will be 4 random participants from whom I will choose 1 commenter to receive a $15 store credit. ~To be included in the drawings, comments must be left by midnight EST Friday, November 30th. So before I share my card I, first of all, want to wish Korin and Dan a very happy birthday. I have been blessed to have been on both the Sweet n Sassy Diva and The Sweet Stop design teams. It was a dream come true for me. As most of you know, Korin knows no stranger and she loves all those that come into her periphery with her sweet spirit. She's always there to lend an encouraging word or to share one of her great designs. I'm the proud owner of a couple pieces of her works or art. They are not merely cards. 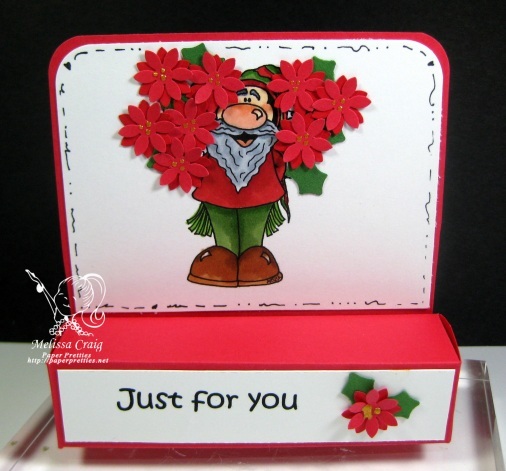 So this is the card that I created using a great sketch from MFT and the inspiration of Silke Ledlow. She does so well with all white... I tried with cream and just a hint of brown. No matter what I did, I couldn't get the photo to come out right. It's much prettier in person - I swear. Enjoy the hop! Happy birthday Korin, Dan & Sweet n Sassy Stamps. I look forward to doing this again for your 10th birthday. Happy Thursday to you. I can't believe how quickly this week is going. Wow! I'm so happy, too, I'm ready for a weekend. I'm also very happy to be sharing this week's Delightful Challenge with you. This week we're playing with Festive Florals. 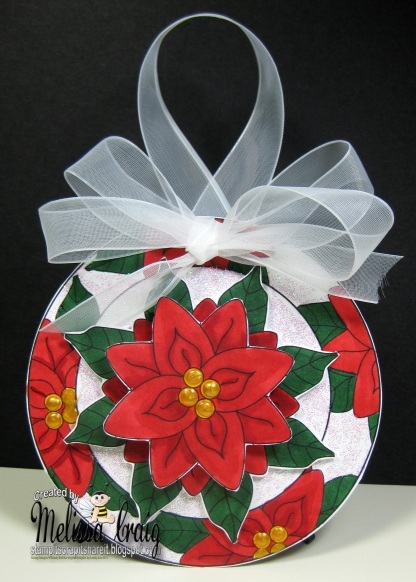 I am using the Poinsettia Set which I think is gorgeous. OK - this really did start out to be a card and then it took on a life of it's own and decided it was going to be a blinged out, very shiny, very beautiful ornament. I think it turned out really pretty! I love it and I think it's going to quite lovely on my Mom's Christmas Tree. Here's a close up so you can see the glitter and shine that I added using Stickles and a Paper Pen. I hope you to see you play this week at Delightful Challenges and go ahead, make an ornament, it'll be fun! Good Morning! 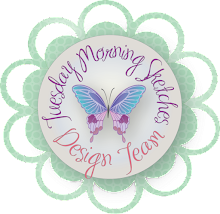 I have a new sketch posted for you on the Tuesday Morning Sketches blog and you're not going to want to miss playing with one. It's easy and fun and very versatile. I think you'll like it a lot. We're also sponsored by DRS Designs and they've generously supplied us stamps to play with. 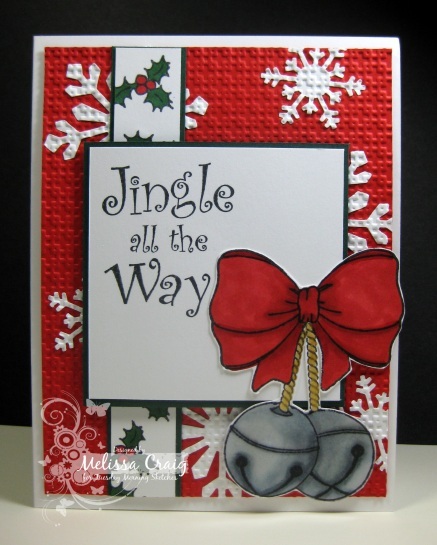 My card features Jingle all the Way and Bells & Bows. I love my card, I hope you do, too. I added glossy glaze to the bells to give them a metal shine and also colored the rope with a gold paper liner pen. I am very happy with the results. I do hope you'll come join us this week. Good Morning and Happy Monday!! I hope you all had a great weekend, I sure did. It was laid back, it was crafty, it was filled with good food. I made baked rigatoni last night - yummy! 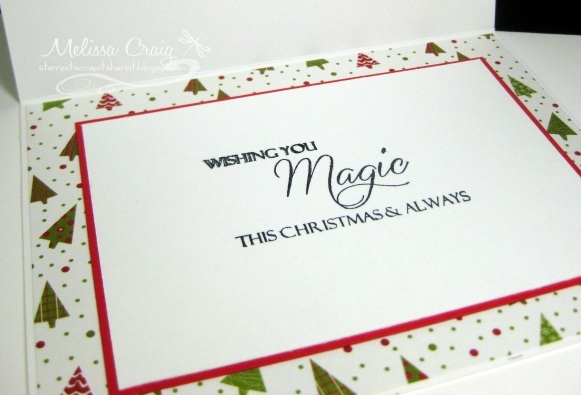 This week at Paper Pretties we've got an Anything Goes challenge. This week I chose to make a little treat holder that was on a tutorial by ChicnScratch. Now my sample is missing the treat that goes in because when I decided to make this it was 11:00 at night and wasn't going to the store, so you'll just have to use your imagination that it's there. Mine will eventually hold a Ghiradelli chocolate. So here's the front of it. This will hold a couple of chocolate squares. I created by first printing off digi paper. I used All Wrapped Up that I found at A Cherry On Top. I printed the red and then I put it back in my printer to print the red polka dots. Then cut it down to 8" square. Then using my Scor-Pal I did the score lines and then folded. This is such a super easy project and would be easy to make a bunch of these. This is the other side and here's where you can either put more treats or as I did, a little greeting. I didn't picture it here, but the little message does have a bit of design interest. 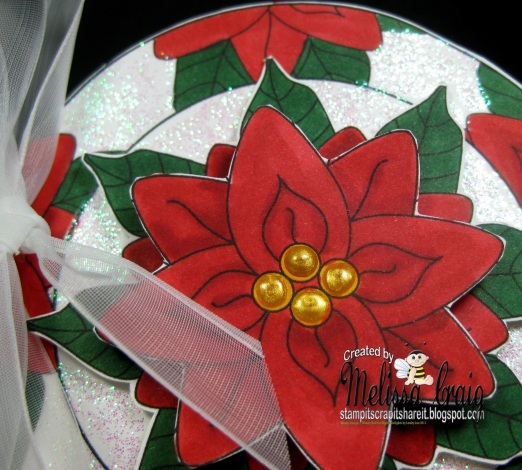 I used a snowflake border punch on the white card stock and then adhered it to the red. There's plenty of room for a personal message. I hope you join us this week and really challenge yourself. Not that this was challenging - it was fun and easy. Cyber Monday at Raisin Boat!! Hi everyone! Just in case you don't receive the newsletter from Raisin Boat, you don't want to miss this amazing sale. WOW!! Here's a clipping from the newsletter - be sure to visit RAISIN BOAT for more details. Buy any 4 Raisin Boat stamp sets, get any 1 stamp set free! Buy any 4 of our new Short Cuts, get a package of Pretty Labels Short Cuts (any color) free! You'll love these easy and quick ovals, circles, frames, and other pre-cut cardstock pieces that you can layer! Buy our new acrylic memory display PLUS any stamp set, and get a free recipe or calendar printable download! What a great gift idea to make recipe books or calendars with this adorable Heidi Swapp memory display! See samples below. Save big on our rectangle window tins! Get our rectangle window tins for just $1.99 each - a more than 33% savings! Check out our samples below for ideas on the fun goodies you can put inside. Buy 1 package of our new holiday Innies and OutiesTM, get any 1 package free! 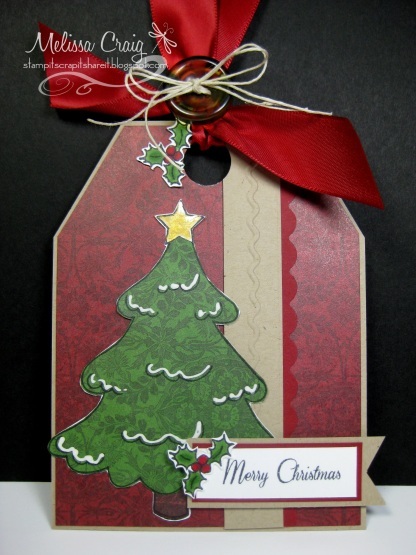 Our 8 different new holiday Innies and OutiesTM verse packages finish your holiday cards the quick and easy way! Now, I don't just love RB stamps - I LOVE LOVE love the card stock. The quality of the Boathouse Collection card stock is amazing! I found a tutorial on You Tube for this beautiful wreath. 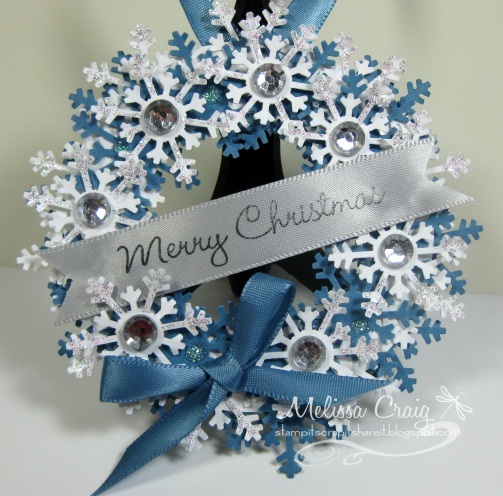 Using a punch I picked up at Michael's over the weekend, I punched out snowflakes using Brighton Beach White and Varsity Blue card stock. I cut a 3-3 1/2" circle and about a 2" circle in the center to create the base. 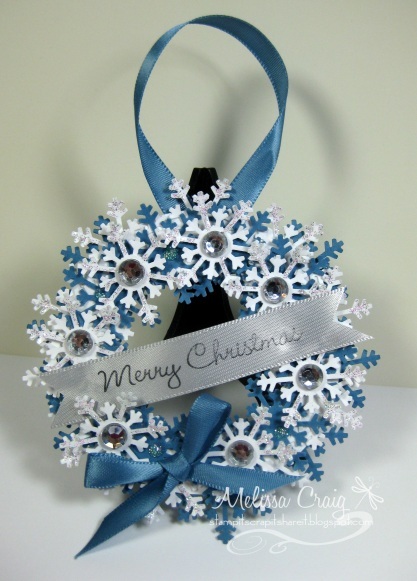 I glued down the first layer of snowflakes in white and then added the blue on the front and back. Then added another layer of white snowflakes to the front. Then I went totally bling-y. I added rhinestones and then used Glitter Liner (Holo Iridscent) pen to add more sparkle. Added ribbon that I had in my stash that matched the Varsity Blue perfectly. But you don't need to worry, Raisin Boat has ribbon in stock at very reasonable prices. Then I took a scrap of silver ribbon and stamped the greeting on it to make a banner. When stamping on ribbon, you want to use StazOn, it's the only ink that won't bleed and smear your words. Here's the tutorial that followed. Now let me wish you HAPPY SHOPPING! Happy day after Thanksgiving. I hope you enjoyed the holiday with your friends and family. It was just me and my kids. Dinner turned out well. 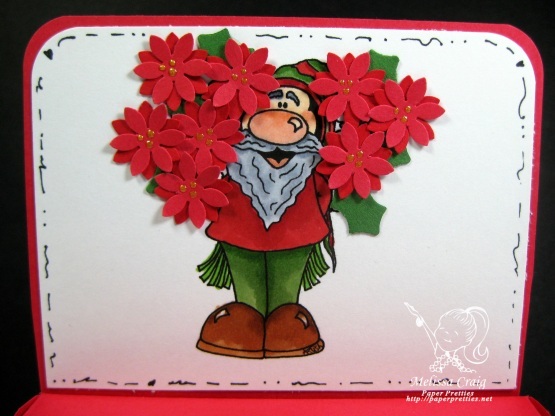 The newest challenge is up at Fun 'n Flair and this time we're making Anything But a Card. 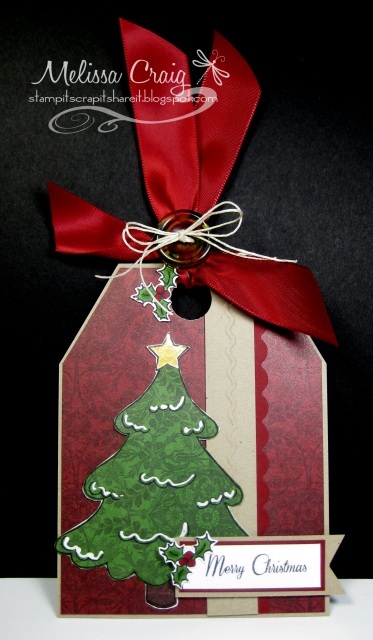 I love ABC challenges and for my project, I made a gift tag. Just what we'll need to dress up those Black Friday purchases. Oh, did I mention there's also a color combo thrown in there, too? Red, green and gold. The gold was the hardest part for me because I don't have any cool metallic paper or ribbons that I care for, so I colored the star with a Paper Pen from Raisin Boat. So my gold is very little, but it's in there. I did base my tag on a sketch from Clean and Simple. Have a great Friday and thank you so much for stopping by. Hello. Whew! What a line up for today and now I have to go cook! I promise this is the last post for today. I wanted to keep this one clean and simple just to show you that you can create so much by doing so little. I learned this from Tami Mayberry. My card allowed me to use my Scor-Pal for something other than to make a piece of card stock into a card. I then scored a couple of lines to make a border for snowflakes. 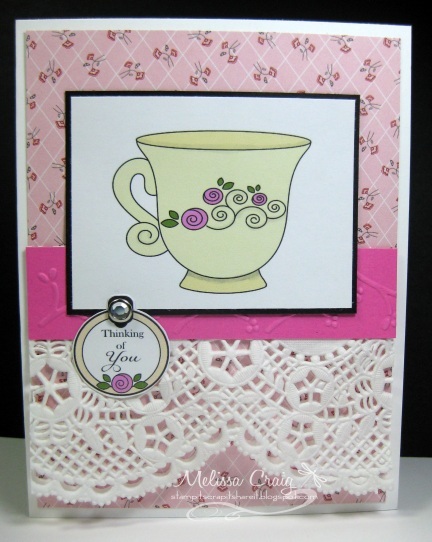 Then I finished it off with a sentiment stamped onto a Spellbinders die element. CAS-ual Friday challenge was the inspiration. Hi again. Thanks for coming back. Yes, I am here to tell you that we are still playing at My Time Made Easy Pretty Patterns even though it's a holiday here in the US. You may ask why and the reason is, some of us stampers would rather stamp and play then get overstuffed with turkey and watch football. I hope you're with me. I actually designed the sketch around this stamp set because I already had in mind how I wanted my card. It was harder for me to put it to a sketch. 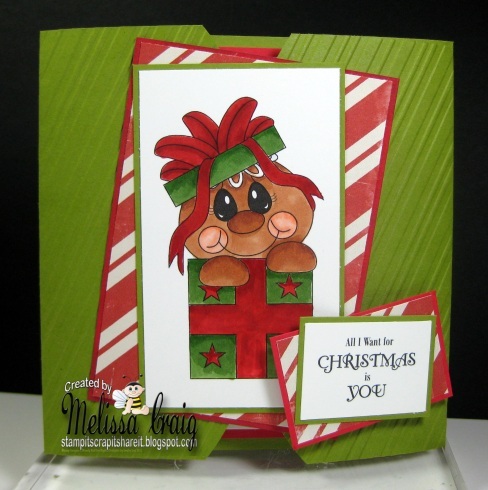 This was such a fun card to make and it's toddler friendly. No small parts that could become a choking hazard. This is Magical Birthday Wishes and I just love this set. Levi and Hollyanne even had their input on it. Levi chose the colors and I got Hollyanne's squeal of approval. I can't beat that. This is the first of a few posts today. I have so much to share with you! At Delightful Challenges we're playing with color - RED & GREEN. 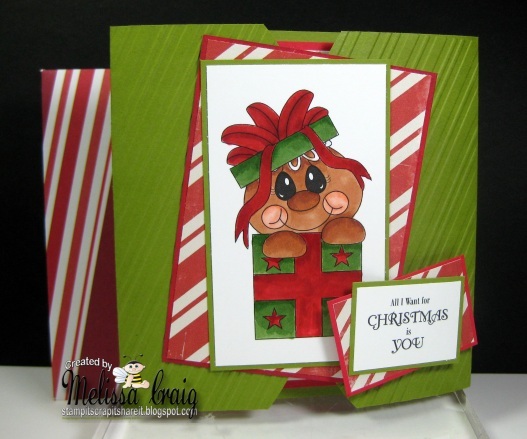 My card is featuring the adorable Ginger Baby Lolly image. I lovey her!! The card layout is loosely based on Mojo Monday's sketch. I'm not linking it up because I did leave out some elements. But I love the simple design of my card, I feel it really allows the Ginger Baby to shine. As I said, I have a few posts today, so I'm keeping them short and sweet. Good Morning! It's Tuesday so that means there is a new sketch up at Tuesday Morning Sketches and this one was created by Bonnie. It holds a lot of promise for a lot of fun and creativity and you're going to love it! 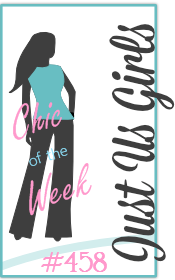 This week's challenge is sponsored by Digital Delights by Louby Loo. I had the fun and fortune of getting to work with a cute little image. Now I know you're thinking to yourself that I am on the design team for them and I get to play with their images weekly, but this one is a new image to me. Now does this card look like a Christmas party just blew up all over it? I love how this turned out. I used some old and new elements on my card. I've had those QuicKutz dies for years (letters) and it was time to dust them off. I do have to admit that I did color the image on the computer and then enhanced with Copics. This is such an intricate image, I needed the little cheat. Now head on over to TMS and play along with us! Good Morning! I hope you had a great weekend. Mine was OK, not as productive as I'd hoped in the craft area, but other than that it was a good one. 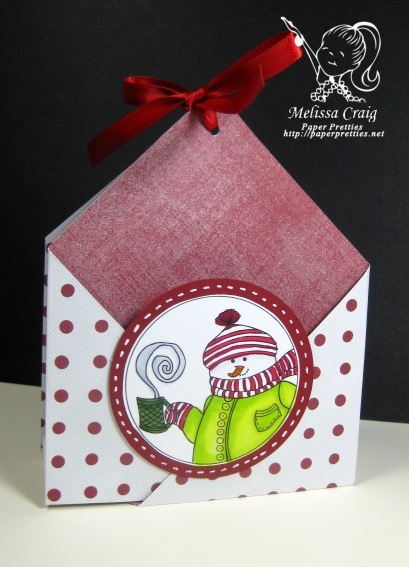 I have a fun project to share with you for this week's Paper Pretties challenge. This week we're making Anything But a Card. I love these challenges! This week there is a re-release of a super cute image by ARTish. This is Garner. I'm posting a picture of him so you can see what he actually looks like. I did find inspiration from a great tutorial on SCS for a Flat Back Treat box. A lot of fun to make! I dressed Garner up in Christmas cheer and then used a couple of punches to turn his spring-y bouquet into a festive bouquet of poinsettias. What do you think? I rarely use my punches and I don't know why because they can be a lot of fun! I used a Gold Paper Pen from my Raisin Boat drawer to create the center. The results pleased me a lot. This box will be perfect to stuff a Hershey's Kiss and a tube of lip gloss into for a certain daughter I know. Good Morning! Happy Tuesday. I wish I could I was feeling better, but I'm not. I swear I need to sleep for a few days without waking up. My chest feels like an elephant is sitting on it and I can't get warm... this is Florida! Helll-ooo!! Anyway, enough of my belly-aching. Let's talk about fun challenges. Like the one I have up at Tuesday Morning Sketches. There's a new sketch and it's a Judged Challenge which means there's an added twist. This week we're sponsored by The Beary Scrap so the added twist is to use punches or Tear Bear patterns to create an animal. Here's what I made. I haven't added the ribbon yet, but I'm going to hang this up at work. I used Thom the Turkey Tear Bear pattern to create this adorable little turkey. The thing is, when a critter is made, they turn out to be a little big and this guy filled a regular A2 card, so it was time to turn it up and into a wall-hanging. I love how it turned out! I did a lot of hand stitching with these patterns I won as blog candy. I followed the pattern, poked the holes and then used kraft twine to stitch in the design. I am entering this into The Kraft Journal's challenge as this week it's Turkey Day. I'd say this fits. Good morning everyone! I hope you all had a great weekend. I was off work since Thursday and I had such grand plans to create create create. What ended up happening was me catching a horrible cold and as the days went by, despite my efforts, the cold got worse. By Sunday I could barely stay awake long enough to accomplish much of anything. And now it's Monday, late night last night and I'm off to work. I wish I could've taken another day or two, but I start my new job today. So I pull up my bootstraps and get on with it. I actually created this card last week, it was a mistake. I sat down at my craft table to make my card for last week's challenge and ended up doing the wrong one. So I at least ended up a week ahead. 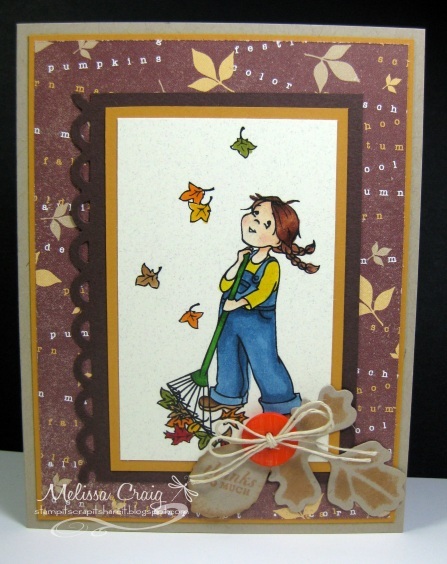 My card is made from last week's Just Us Girls sketch and The Kraft Journal challenge for Harvest. I missed them both. We have a re-release this week at Paper Pretties, but since it was only one image I decided to play with a stamp that I've had and it just needed new attention. This is Falling for you Sophia. This is a perfect fall image for a Thank You card. That's the challenge, create a Thank You card. Thanks for coming back. This bi-weekly's Pretty Pattern is posted and I want to say that it was inspired by our very talented DT Member Nancy Jensen. Let me show you my card and then I'll tell you the story behind it. Honestly, I'm not super pleased with my card. When I started working on it, I had a much grander scheme then what ended up on paper. But still it brought a memory for me to surface. There is a picture of my sisters when they were little with our Grandma. They were having a tea party. Their sweet little hands holding the cutest orange tea cups. Well, I looked at that picture a lot and was sad that I never had a tea party with Grandma. But then I remembered Pearl. When I was in grade school my Mom had a flower shop a few blocks away from where I went to school. There were 4 stores attached to each other and Mom had her shop on one end and there was a little apartment behind it. Well, the store on the other end also had an apartment behind it and the little old lady that lived in that apartment was Pearl. She kept her husband's tackle shop open because she missed him so much. Anyway, Pearl was my friend and I visited her everyday. One day she set up a tea party for us. We dressed in her lacy shawls and had little cookies. It was the best! This card reminds me of her. Pearl was very old, in her nineties and she passed away shortly after that little party. I loved Pearl nearly as much as I love my Grandma, so my card is dedicated to both these wonderful women. Now it's time to join us at the My Time Made Easy blog to play along with us! Good Morning! How is your week going? I'm a happy girl! I am off today and tomorrow, I need a long weekend. I need to play and just do things I love as a kind of a mini vacation before going 100% into my new job. Training has been very slow going since I've been shared the last two weeks. Hopefully my computer will be at my new desk on Monday. I absolutely love how my card turned out. 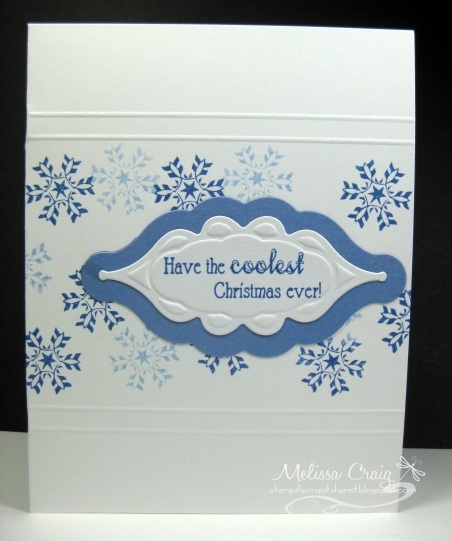 Love that I used Kraft - who would've thought that Kraft would be the perfect base for a snowy card? And then of course the signature face cuteness that Wendy puts into many of her characters. The layout of the card came from the great sketch at Unscripted Sketches. Hi everyone! Firstly, I am so sorry I am late getting this posted. 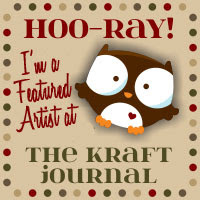 I am thrilled to announce that I am part of the first design team for Fun 'n Flair Stamps. I am very excited to be here! My card features Miss Shayla at Christmas Time. This is such a fun stamp set. 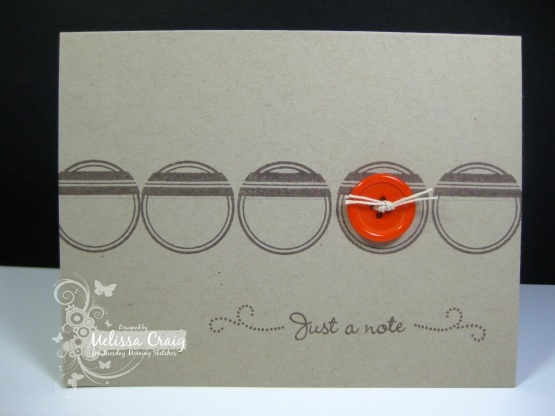 The stamps are big so they are not only perfect for your cards but stand up well on a 12x12 scrapbook page. Honestly, I had a hard time adapting the stamps to a card, but oh the fun I'll have with practicing with them. Here's the inside of my card, featuring a lovely sentiment that's also in the set. I'm not sure if you've heard, but the prize up for grabs is Miss Shayla at Christmas Time stamp set of your very own! Head on over to the blog to play along. Good Morning everyone! I am so happy that it's Tuesday. Not only because the newest sketch is up at the Tuesday Morning Sketches blog, but because I have had the last Mean People Monday on the phones ever! Whoo-hoo!! I have one more half day to be in my old department and then I can enjoy a couple of days off before jumping into my new position full time. Let's talk about the fabulous sketch on TMS. It was created by Jessi and it's a fun one. So much room for creativity. I went the route of CAS. I'm not super pleased with this card, but it's a challenge for me, so I am endeavoring to try to do it more often and perfect it. I wanna be like my friend Tami Mayberry. (Right! Like I'll ever be at her standard.) My Creative Classroom is sponsoring us this week. With over 100 classes to choose from and more to come, you will surely be inspired. I think this is a perfect masculine card, which is the challenge CASual Fridays. I pulled out some old PTI stamps and created this card is a few minutes. I'm also hoping this will count for The Kraft Journal challenge which is Happy Harvest - I used fall colors. So we'll see you at TMS. Thanks for stopping by. Hi everyone. Happy Friday! So happy that the weekend is here, I am ready for some downtime and crafting time. I'm going to work on making some stuff for my desk. It's a really dull space, so I need to pretty it up! I have a quick post for you today. 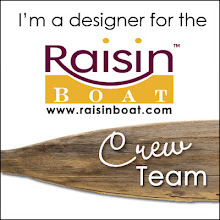 I have a fun project to share with you using the awesome Raisin Boat stamps. I created this fun little box that is perfect for a sweet little treat to share with someone. I had this one piece of decorative paper in my stash and it matched perfectly to the Boathouse Collection Card stock Bear Cub. This is a hard color for me to work with, but paired with this paper and Coffee Bean card stock, this box turned out adorable! My box features the beautiful stamp set, Thankful. Not only is this stamp set perfect for Thanksgiving type cards but also has fabulous images for Christmas, too. Good Morning! Happy Thursday! I hope you and your kidlets enjoyed Halloween, if that's what you do. It was a low key evening for me and my kids. They weren't interested in going to downtown Sanford for the Halloween festivities there, so we had a good dinner at home and just did our thing. 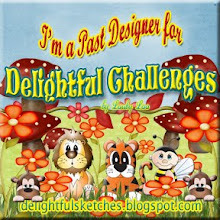 The newest challenge is up at Delightful Challenges and this week we're playing with a fabulous sketch. We're also showcasing some fabulous new designs. I'm using Peeking Ginger Baby. When Wendy sent me this image I squealed in delight and my heart melted! And here is my interpretation of it. I saw the sketch and thought of a gatefold card. I am so happy with the results. I hope you are, too. 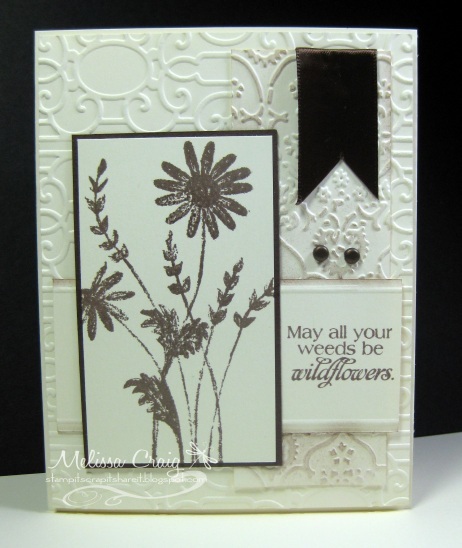 How I created this card: I started with a piece of Old Olive card stock 5 x 11. Then on my Scor-Pal, I scored at 3 inches and 8 inches. Then I took my oval cutters from Creative Memories and cut the rounded edges, I think about 1/4 to 1/2 inch off. No precise measurements. 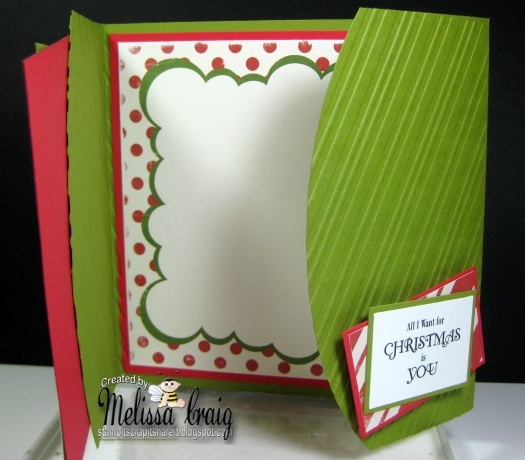 Then I ran the ends thru my Cuttlebug with the candy stripes embossing folder. My finished piece is a 5 inch square card. 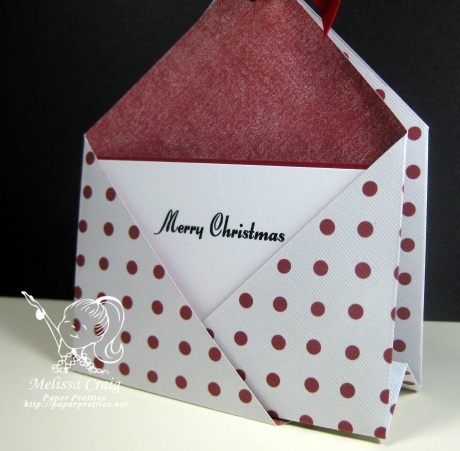 So since it's a square card, I created a matching envelope using my Scor-Pal and Scor-Envy. Now I have a sweet little Christmas card set. Now head on over to the Delightful Challenge blog to see all the rest of the holiday inspiration by the rest of the team. Enjoy!